So here we are, almost a month after the fact but hey, 'betta late than neva' (say it in a sassy, sultry Marlyn Monroe or Jessica Rabbit voice). 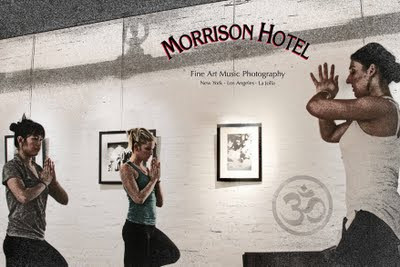 On 4/20/11 I led a yoga class over at the Morrison Hotel Gallery to benefit Guitars in the Classroom. As I work with young 5th graders, I've been brought closer to the exact reason why education has always been a critical issue at the forefront of my mind. I feel quite lucky to have received a terrific education, and I know a lot of it was due to the fact that, along the way, I've had a few stellar teachers who exposed me to new perspectives and frames of viewing the world at the right times in my growth. Anomalies, stand out human beings. The 3rd grade teacher who took it upon herself to teach her students French- via children's songs- in an early-90's Astoria. The albino-haired 10th grade English teacher who so clearly didn't belong in suburban New Jersey (but DID belong at the school) -- dressed in Gucci, former lawyer, TERRIBLY intelligent and refined in the subjects he asked us to think about critically. The art history teacher who made you want to work so hard for her love. Because she made you love the subject so much. Those kinds of teachers are there before you can choose the world for yourself, they open the doors to new places, and those kinds of characters inspire me, and all those they touch, to search deeper; revealing a few decadent crumbs along a trail to exhilarating discovery. And they do this how? They become art themselves. They've touched that place inside themselves that then radiates the works and spirits, drives, emotions and creations, and they pass it on; the gatekeepers to our curiosity and capacity to live full lives through meaningful work, whatever that means to you. I want to spread this kind of enrichment. Enable other teachers to take creativity into their own hands and then share it with their students directly, every day. Yes, kids, we have to learn about the rules of grammar, but what if we all got together for our lesson today and wrote a song about it? And then sung it together?! So I got together with Guitars in the Classroom. And took their teacher's workshop. And saw, experienced firsthand what this charity is doing. Am learning guitar so I can sing with my students! And I can only imagine the benefit to so many more children right here in New York City. Maybe ESL students in East Harlem who could really ease and enliven their learning of English with a song. Giving enrichment to schools that might be in trouble (seen Waiting for Superman?) , teachers getting some art in their own lives, learning how to play the guitar, maybe even holding a guitar for the first time. Democratizing the making of music so more of us can carry a tune in our hearts, a tune we helped create. Taking the edge off city life. So we did some yoga at the beautiful, warm, good-vibe-filled Morrison Hotel Gallery Loft to raise some money. So that more schools, more students, more teachers in New York City can get this beautiful chance. Want to get involved? Know a school that could use GITC? Alexandra, your words resonate. It seems we have come as a society to be doused with messages that commodify everything and objectify everyone and your seeing and saying what really matters shatters those falsehoods. It is the enlivened artist within the individual who teaches children who can awaken their spirits and improve their lives. Thank you for understanding, embracing, and supporting the work of Guitars in the Classroom with your insight, passion, and talent. You are a beacon and we are so blessed in this friendship. May your vision- of creating a world where more teachers light up on the inside to light the hearts, souls, and minds of their students- be fully realized! I hope everyone who reads your blog comes to your next yoga class! Indeed, Alex... It is all about the inspiration. How wonderful that you are inspired as you are to learn, and then recreate that wondrous experience for your students. This is the best of what the arts (including the healing art of yoga)have to offer, and it's truly a gift to be able to pass on this open spirit to youngsters in their formative years. Brava to you! !